When you have a baby, you have to do everything in your power to keep it safe. Occasionally, you will have to entrust your baby to a nanny. You can make sure that these sessions go as intended by using a nanny cam. This is a super-secret nanny cam that comes packed with features. If it’s completely secrecy that you desire, this will be the perfect device to install in your home. This nanny cam is uncannily disguised as a regular LED lamp. It works like one too. You can turn it on and double the nanny cam as a desk lamp or a night light if desired. Inside this “lamp” is a 1080p HD camera hidden well. The camera has infrared night sensors to record in complete darkness as well. The cam is equipped with 2-way audio to record conversation as accurately as possible. On top of it all, the nanny cam has a motion sensor as well. You can set up the nanny cam to record video continuously without interruptions, or only when movement is sensed. The cam stores recordings in an SD card. You will get a free 8GB micro SD card upon purchase.Storage is expandable up to 64GB. You can also view a live feed of the recording on your smartphone with a Wi-Fi connection. Recording will not be interrupted when you opt for the live feed. You can listen to audio as well. By far, this is definitely one of the best nanny cams available in the market. This nanny cam comes with high connectivity. You can easily sync it to your Android smartphone or an iPhone. You can watch a live feed via Wi-Fi, 3G or a 4G network connection. The Puretech cam is equipped with a motion detector too. You can set it up to send a video notification immediately if any motion is detected. If your baby is supposed to be sleeping alone, this is a good setting to have. You can also keep the camera recording continuously when needed. The camera can simultaneously record and keep the motion detector activated. The nanny cam has 2-way audio and night vision. The camera lenses are wide and angled at 127 degrees. That a good spec for recording video in low to zero light. The cam has a speaker as well. Video is recorded on an SD card with storage up to 32GB. This capacity is enough to record video 24/7 for a week. The camera works by plugging in or via battery (optional battery pack must be purchased for this). EASY SET UP - Just download the app, connect the camera to your Wifi and off you go! Toguard is a highly discreet spy and surveillance camera that will be extremely difficult to spot unless your nanny is a well-trained spy. This nanny cam is amazingly disguised as a USB wall charger. You can keep it plugged in at all times without raising suspicion. This solves another problem: power. Most nanny cams easily run out of power or have to be plugged in with a cable at all times, which can be dead giveaway. You won’t run into such problems with this one. You can connect this nanny camera to a computer or a smartphone. This camera can be simultaneously connected to 8 devices total. The 1080p HD cam can stream 720p video at 25fps without major lag. The camera has a 90 degree viewing angle. It also has a motion sensor that can detect objects up to 5 meters all around. You can activate the sensor any time you want. You will get a free 16GB memory card with each purchase. This nanny cam is cleverly disguised as an alarm clock. It works well as an alarm too. The cam, though a bit small, works as both a video and audio recorder. This nanny cam is multifunctional. You can set it up to record video discreetly in any room. 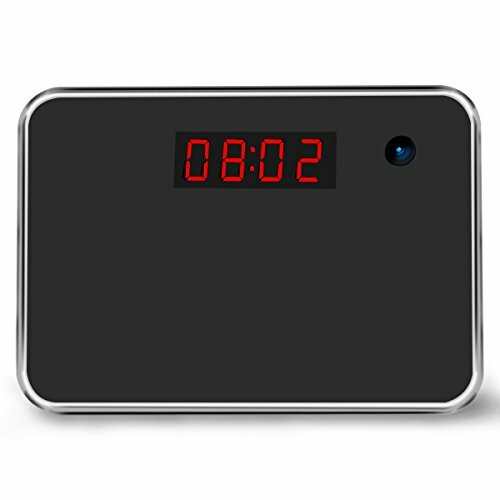 When you do not require secret surveillance, you can easily use the nanny cam as an alarm clock or even as an external web cam for your computer. The nanny cam comes with the built-in thermometer too. It runs on batteries, which are rechargeable. Battery life can last up to 35 hours of continuous recording. The downside is that, unlike with plugged in nanny cams, you will have to remember to charge this every night if you intend to use it the following day. 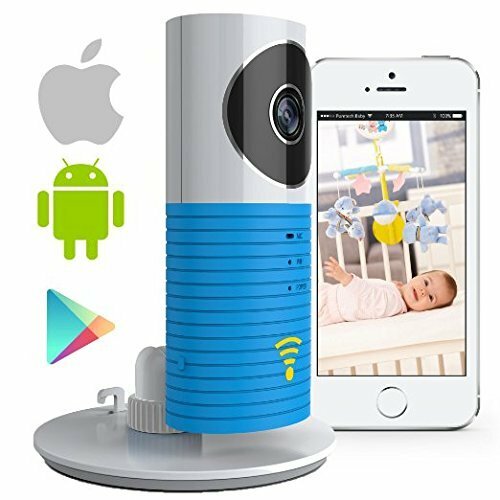 This is an affordable nanny cam that delivers utmost discretion when recording video when you baby is under someone else’s care. This cam records video in 720p HD resolution. The video can be streamed to a smartphone or a computer via Wi-Fi or a 4G network. This cam also has night vision which records in complete darkness up to 32 feet with clarity. Audio recording is also possible. This nanny cam can be connected to multiple devices supported by Wi-Fi, like smoke alarms or door bells. It’s useful when you want immediate notification of motion in a designated area. For example, if the smoke alarm goes off, you will know via the cam feed. 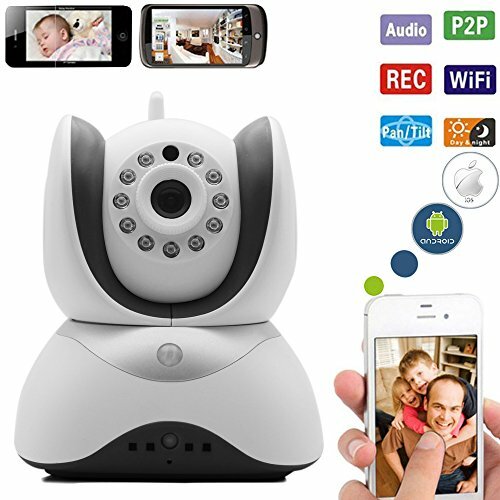 OUR WIRELESS MONITOR CAMERA WILL KEEP AN EYE ON EVERYTHING YOU LOVE WITH AN EASY PLUG AND PLAY SYSTEM: Install on Iphone/Android tablet or computer with a few clicks of a button! Then record in HD day or night with IR and Motion detection technology so it doesn't miss a thing! Easily set and send alarms to to take snapshots or videos to your phone let you know when there is motion in a room. Seamlessly stream video and playback recorded video of your home, nanny, kids and your pet. Conclusion: Mainly, there are 4 things to consider when buying a nanny cam: audio and video recording, motion detection, night vision, and complete discretion. If a nanny cam comes disguised as a desk lamp, make sure it works as a desk lamp. The nanny cam will not work as you intend if it’s not hidden in plain sight. You can consider other features as well, like memory capacity. Look for nanny cams with expandable memory capacity if you plan in recording continuous video. Pay attention to the power source as well. Battery powered nanny cams have limited power, so they may turn off too soon when continuous recording is available. If you buy a battery powered nanny cam, make sure it can run for more than 24 hours. Look at all the features on offer and consider the price carefully before investing in a nanny cam.